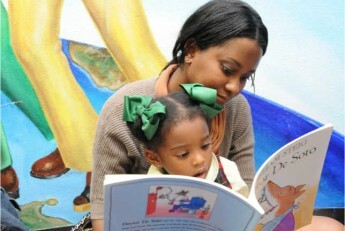 PRIME TIME programs encourage families to read together. Image courtesy of the Louisiana Endowment for the Humanities. PRIME TIME offers intergenerational reading- and discussion-based literacy programs to underserved children and their families across the United States. The organization was created by the Louisiana Endowment for the Humanities, a state affiliate of the NEH, in 1991 and offers a range of literacy programs. These include Family Reading Time for 6–10 year olds and their caregivers; PRIME TIME Preschool for Pre-K children and their caregivers; and PRIME TIME Home Room, which offers professional development for primary school teachers. Since it was founded, PRIME TIME has held programs in 40 states, serving more than 40,000 families in communities with high-needs schools. Over the past decade, the NEH has helped PRIME TIME expand its reach throughout the U.S. and is now helping the organization reach new communities throughout its home state that demonstrate great need for the program. In a 2011 national survey, 80.4% of PRIME TIME participants reported a positive change in their attitudes toward reading. Image courtesy of the Louisiana Endowment for the Humanities. PRIME TIME has held programs in 40 states, serving more than 40,000 families in communities with high-needs schools. Image courtesy of the Louisiana Endowment for the Humanities. Aimed at parents/caregivers and their 3-10-year olds, PRIME TIME Family Reading programs promote academic achievement, positive attitudes toward learning, family bonding, and library use. In a 10-year impact study of the program, researchers found that 3rd graders who participated in PRIME TIME performed higher on 95.5% of the Integrated Louisiana Educational Assessment Program, the state’s standardized literacy assessment. And in a 2011 national assessment, researchers found that participants increased their public library use by 17.2% each month, while 80.4% of the participants reported a positive change in their attitudes toward reading. In 2017, PRIME TIME was honored by the Library of Congress with a Best Practices Award for their work to promote literacy. Video courtesy of the Louisiana Endowment for the Humanities.